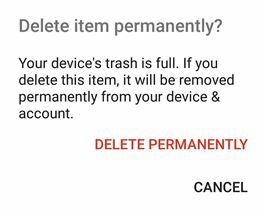 After seeing this message – Device Trash is full, the first thing which I did was check whether my storage space was full but there was space, then I realised that the message Device storage is full refered to the stoage in Google Photos and not your device. Trash in Google photos is similar to Recycle Bin in Windows, where deleted photos etc are stored in Recycle Bin before being deleted. So the photos you delete in Google Photos from your phone are stored in Trash for 60 days and then get deleted automatically. So now we know what the problem is – Trash section in Google being Full as you might have deleted a lot of photos at a time. All you need to do is, empty the trash section and you can start deleting photos in Google Photos without any Error. Step 6: To Delete selected photos – Tap and hold on one photo and then select the other photos which you want to delete and Tap on Delete option at the bottom of the screen. You are done, now you can go back to your Google Photos and start deleting the photos which you were trying to delete earlier. If you are still facing this Error after following the steps mentiond below, you need to clear Cache and Data which will fix this Error – Follow the Steps mentioned in this Video.